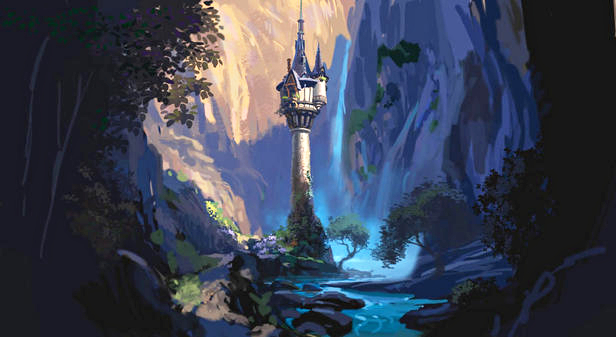 Tangled is the 50th feature-length animation by Disney and to celebrate they even they decided, instead of re-inventing the wheel, to go back to their origins. There has been quite a lot of debate recently on whether, among all the Pixar masterpieces, the likes of Shrek and Ice Age, Madagascar and so on, there’s actually any space left for Disney Studio. Had the irreverent tone of Shrek towards fairy-tales actually manage to destroy Disney’s approach to telling fairy tales forever? Well, I was the first one to admit that after a film like Shrek, where the princess sings with such a high pitch note that a little bird next to her explodes, it would have been impossible to have another girl singing and dancing barefoot in a forest, surrounded by animals, birds and flowers. And yet somehow this film manages to do that, without being cheesy and it not only confirms that Disney is alive and well… but also that I was dead wrong! (And, for once, I am really happy to be wrong!). The wonderful thing about Tangled is that underneath all the pointy, giggery 3D, the almost perfection of the visuals and the sharp humor, which we’ve now become to expect from this type of film, it’s actually a very traditional Disney fairytale. And yes, the girl is singing barefoot in the forest, surrounded by flowers and animals (Thankfully none of which sings or even talk! Good choice!) and you know what? It works! You can probably tell (… and smell) that there has been a lot of thinking and brainstorming behind each scenes to bring Tangled to the screen. Every single element that used to make a Disney feature-length animation a classic is here, and each of those elements all been carefully calibrated so that they not over-done and they would not annoy anyone. Thus, the songs are there, but not too many and they restrained that Hollywood-fest/Broadway over-the-top feel that you found on those classic “Be our guest” or “Under the Sea” numbers. Something that worked for those kind of films, but it was becoming a bit of a caricature. The closest thing to those is “Mother Knows Best”, possibly the film’s top musical number, which manages to be catchy, inventive and yet it done very tastefully. The lovely princess is there too, though she has obviously been upgraded for the 21st century audience: she’s a much more active and stronger character and yet she has a conflicted personality, more than any Disney princesses before. The scene where she she’s just been rescued and her mood changes from happy to terrorized to desperate , all in the space of few seconds, is genuinely quite funny. The great action hero is there too, looking hot as ever (apparently there were “hot guy” meetings held at Disney to make sure that every little girl would fall in love with guy). They also made sure that he would be the main character of the story just so that it would not alienate the boys too (the film has also been renamed from Rapunzel, once again in an attempt to not seem like another “princess” flick aimed strictly towards girls). He’s charming, funny and also plays against those post-Shrek expectations, with lines line “I don’t do singing” or “I don’t do back-stories”. And finally you get the animals sidekicks, all of which are spot on too. Maximus, the horse (you just wish the was more of him) and a cute chameleon Pascal. Once again you can tell there are probably born out of team brainstorming, with tie-in toys in their heads rather than true inspiration. However, despite all these calculated steps, the whole film feels effortless and done with a real heart behind it too. And when the big moments finally do arrive, they really work like magic ! For example the first time the Mother goes up the tower and the music swells over the wide vistas or that marvellous sequence in which thousands of floating lanterns light up the night sky (also allowing the animators to really use the 3D to maximum effect): this is what cartoons should do: make the impossible seem possible and make it look beautiful. The action set pieces are breath-taking too (The scene with the water, all the chases in the forest, swinging from trees or riding horses..) and the romance is strangely believable and heartwarming. The end result is an immersive 3D experience featuring the best of both schools of animation: great characters and storytelling (yes, it’s all pretty formulaic, but so are the best fairy-tales for kids! ), and perfect technical achievement! Tangled might not ultimately be a modern Disney classic, but it’s the closest thing to it from Disney Studios in a very long time (even though I did like the Princess and the Frog). Let’s hope it’s the beginning of a new age for Disney. If I had a kid, this is the type of film I would like him/her to fall in love with and watch over and over again. Great review.. Am looking forward to watching this movie.. So I’m not the only one who’s noticed! Most of the Disney villains have a habit of falling out of conveniently placed windows, or just… Well. Falling. I think it’s because it’s easier than seeing someone stabbed or shot, because despite its humor, Disney’s main audience are still children, and with a villain falling to their death, the audience doesn’t have to see the death. I enjoyed your review. I agree that the flow of the movie didn’t feel forced in any way. I think it was easy to follow and I loved that it wasn’t overstuffed with music. .. Hey.. What about Toy Story3 though? Great review. I was so pleasantly surprised to see that they weren’t giving in and throwing out an easy to make computer animated movie. I really really want to see this. Might go and see it this weekend. Glad you gave it a good review because I am looking forward to it. Disney isn’t necessarily always brilliant, but they seem to have gotten it right with “Tangled”. TRUE GRIT tomorrow night as part of Double Feature Friday though. Can’t wait! Let us know if you liked it in the end.